Ok, let's go!!! We've been teasing it for about a month now but it's time to get to it!!! LADIES, this one is for you!!! On March 31st, ATL Bite Life along with our sponsor HEINEKEN, will be taking over Cajun Crab House on Butner Rd (off of Camp Creek Pkwy) from 4-7pm for our very first competitive eating contest!!! We're offering a $250 CASH PRIZE for the woman who can crack open the most crab legs and down them within 10 minutes. Easy, right?? So many of you ladies have been hitting us on Twitter talking big stuff about how these other girls don't stand a chance. Well, it's put up or shut up time now!!! But you gotta be in it to win it. It costs $10 to enter the competition and we're only allowing a maximum of 12 contestants (first come, first serve). So I suggest you get there early to claim your spot in the contest. For everyone else who just wants to come by and check out the competition or for you lightweights who can only eat a normal serving of crab legs, Cajun Crab House is offering a special of 2 CLUSTERS OF CRAB LEGS + A SIDE OF CORN for $6.99!!! That's in addition to our Heineken specials that will be going on for the duration of the event. Three will be a DJ on deck for the event and special appearances from some of your favorite guests from The ATL Bite Life Show. A portion of the proceeds from the event will be going to Hosea Feed The Hungry. So you can actually be a glutton for a good cause. What's better than that?? Tell a friend to tell a friend. 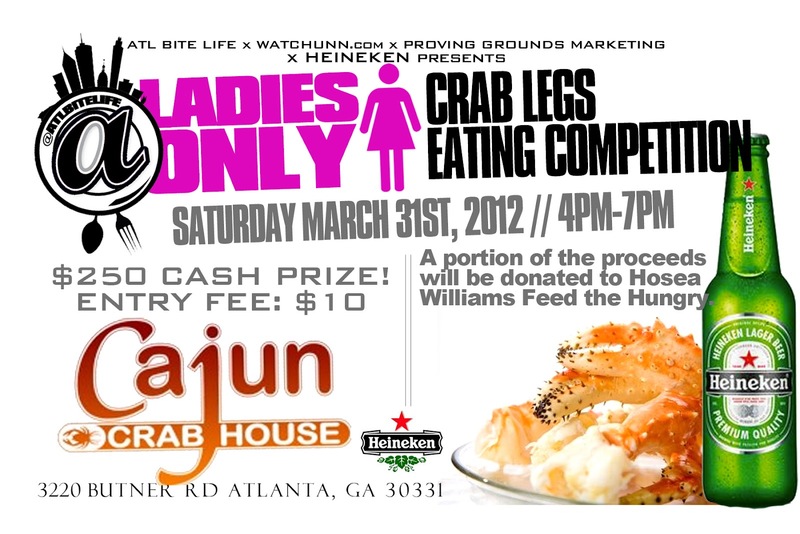 THE ATL BITE LIFE LADIES ONLY CRAB LEGS EATING COMPETITION IS GOING DOWN SATURDAY, MARCH 31ST FROM 4-7PM!!! Okay I can't wait! I need rules...lol are we including claws and or just the legs? How can I enter? I would like to sign me and my girlfriends up. You just gotta show up the day of the event at 4pm. We're signing people up first come, first serve!! !